For most of us, backbends are challenging because they represent the opposite movement regarding our daily habits. This is the reason why they are so important as they rebalance the movement of the spine and give space to the front of the body, especially the chest. In this 2-hours workshop, we will first look at the essential notions of anatomy to understand and be aware of what comes into action in our body when we perform backbends (shoulders, ribcage, psoas, core muscles...). Then we will warm up, strengthen and stretch to deepen these powerful and energizing postures safely and with a serene mind. This workshop is open to all levels. Just an advice: come with an almost empty belly. You will soon receive a confirmation. 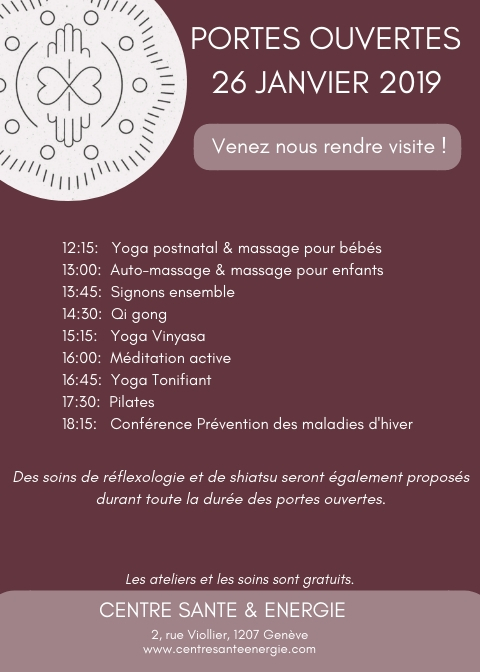 During the open house day of the Centre Santé & Energie, come to follow different classes such as qi gong, active meditation active or Pilates, or come to try some shiatsu or some réflexologie. You will also be able to follow one of my Vinyasa yoga class at 3:15 pm. All levels are welcome and everything is free so don’t hesitate ! All equipment available and a snack will be served.